At little more than a year after its initial launch, Fortnite Battle Royale has managed to become the most popular Battle Royale game of the year. A great chunk of the online community has at least a sense of what Fortnite is, or at least of its existence, given how the game has viralized all over the internet: From fierce matches amongst friends, official tournaments where the prizes are worth thousands of dollars, to never-ending Twitch live streams of players broadcasting their battle skills. Explained very briefly, Fornite Battle Royale consists in a survival game where players are, literally, thrown into a island with the sole purpose of defeating 99 other competitors in order to win. Every match lasts roughly an hour, which gives players 60 minutes of pure adrenaline and survival combat. Fortnite is constantly being subjected to comparisons with fellow battle royale game, PUBG; however, Fortnite has particularly stood out thanks to its cartoonish, colorful character style, and quirky, fun gameplay. Given the premise of the game, it is understandable why it’s reached such a high popularity status so soon. 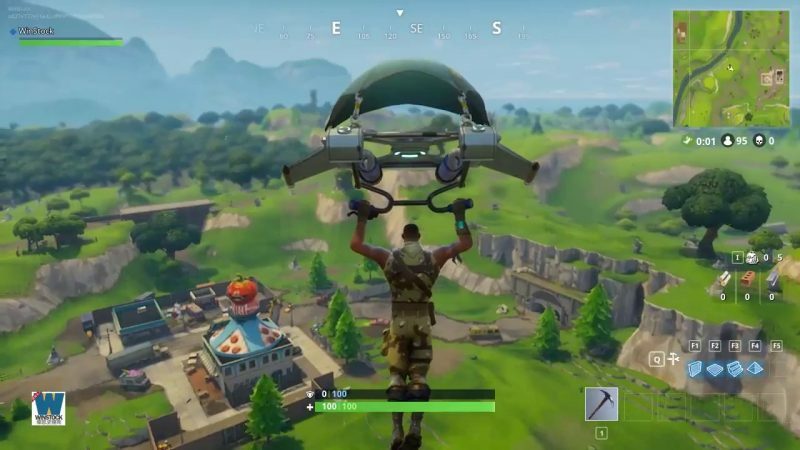 Early on, back when it was launched, Fortnite was only available for Windows, macOS, Playstation 4, and Xbox One. Soon after the game was 6 months old, and due to its enormous growth, Fortnite became available for iOS and Nintendo Switch users, with overall positive reviews and feedback. It wasn’t until this last August that the game was finally released for Android users, thus ending the long-awaited and highly-anticipated rave of the Android community. 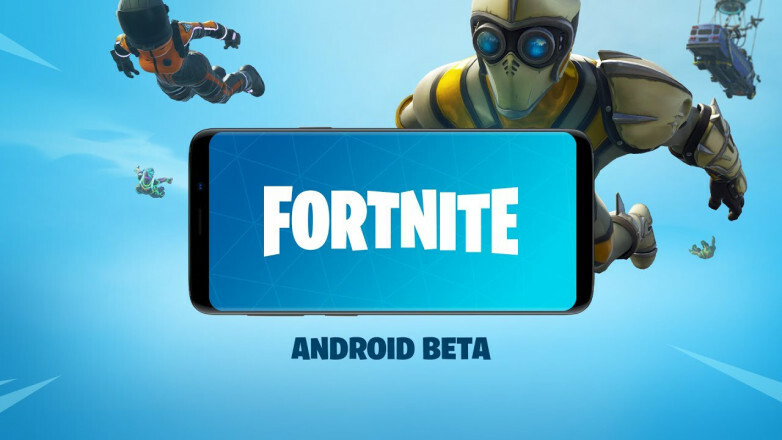 For the time being, though, Fortnite is only available in its beta version, and can only be downloaded through Epic Games’ own website, or through Samsung’s app store. 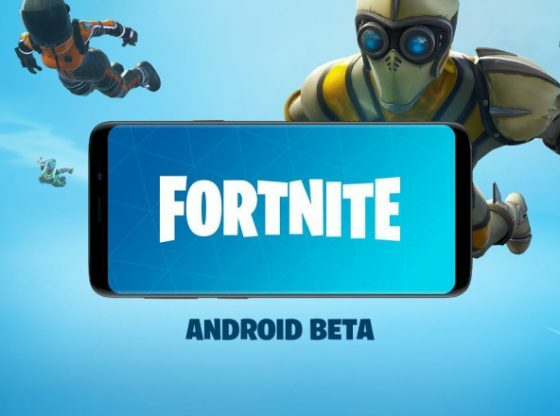 But the question remains, does Fortnite for Android meet the expectations? Does it provide as good a experience as with the other platforms? In this article we’ll give a general overview of the game in terms of performance, gameplay, and graphics. In Fortnite for Android, just like with the rest of the platforms, the game begins with you and 99 other players flying through the skies inside a yellow bus, which is propelled by, oddly enough, balloons. Shortly after, everybody gets thrown head-first into a deserted island, with only a glider and a pickaxe to defend themselves, all the while being slowly enclosed by a deadly storm. What follows is 60-odd minutes of thrilling tension and adrenaline where the topmost objective is to be the last one standing, and to achieve this, besides killing as many opponents as possible, you’ll need to scavenge for food, materials, weapons, and also build you own forts for protection. We are happy to announce that Fornite for Android remains a faithful reproduction to the PC and console versions, with the same means for fighting, building and scavenging, although with some necessary tweaks here and there. As we mentioned earlier, each player is initially assigned a pickaxe and a glider. While those two are certainly usable as weapons, they’re by no means lethal, and instead their usability lies in harvesting. Throughout the game, every player will need to move around the map to collect weapons to defend him or herself (namely, guns and explosives), healing items, and building elements such as metal, wood, and brick. This particular task (scavenging) is achieved quite differently in the mobile versions: instead of pressing any particular button, it will only take running around an object, and it will be automatically collected. Given the limited space provided by mobile screens, the act of pressing buttons is a little bit constricted, and so this version has an option that, if turned on, will have the character automatically shooting at any enemies within visibility range. Also, two static buttons placed above the right thumb are there specifically for jumping and crouching. Sometimes, in order to keep safe, your character has to build forts and walls to protect him or herself. This is an act that needs to be done quickly and efficiently. Disappointingly enough, building isn’t an advisable activity when playing on mobile devices. First, you have to press a button to enter the building mode, then select a material and structure of your choosing, and hit build. 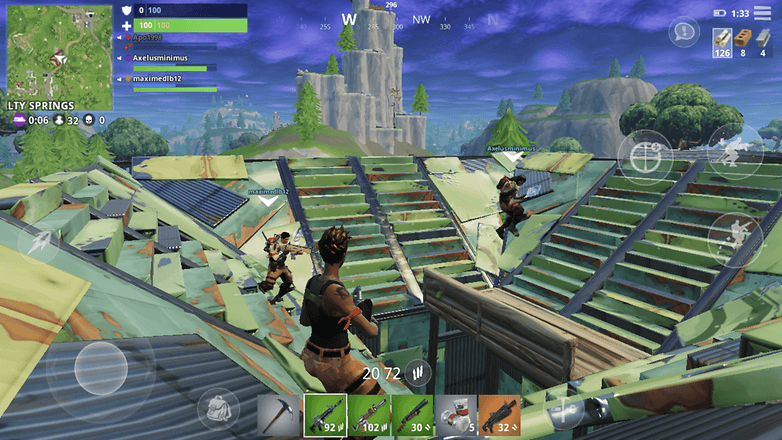 Considering that mobile games are generally slower than their PCs and consoles counterparts, building is a big no-go in Fortnite for Android. Obviously, controls are vastly different from what we’re used to, but they’re not terribly bothersome. On the left side, there’s a virtual stick that simulates movement and rotation, and just above it, a firing button that if pressed once, it’ll shoot once, if kept pressed, it’ll shower your enemies with bullets. One the left side, there’re the aforementioned buttons to jump and crouch, one for each action; there’s also an aiming button that’ll show you the sights of the gun; and on the upper left side, you’ll find the switch button for building and fighting modes. It is never expected for mobile versions to run as smoothly as they do with other platforms. However, and maybe because it’s still in a beta version, Fortnite for Android is as of this date quite disappointing: Frame rates aren’t sufficiently fast, and the overall feel of the game is also laggy. This poses as a big issue in time-pressing situations and it all depends of how fast you act. Thankfully, the mobile versions (both iOS, and Android) don’t allow for cross-platform matches, otherwise, it would be very unfair. Graphics-wise, they’re a definite downgrade, even for the iOS version, which is saying a lot. Even so, they’re not terribly disastrous. The game is definitely playable, and most importantly, enjoyable, subpar graphics and all. Fortnite for Android offers a nice gaming experience, as far as gaming experiences go, which is kind of the point when it comes to games. Is it an above-average version of all of its predecessors? Yes. Is anybody willing to change regular playtimes from Switch to Android? absolutely not. Even so, if you don’t have the means to regularly play in any of the other platforms, Fortnite for Android will surely suffice in delivering an entertaining and thrilling time.